Along the fence that encircles the plant, logs are stacked 40-feet high. Longleaf pine, southern red oak, white ash – pretty much every tree species that grows in the southeast could be used to make wood pellets. 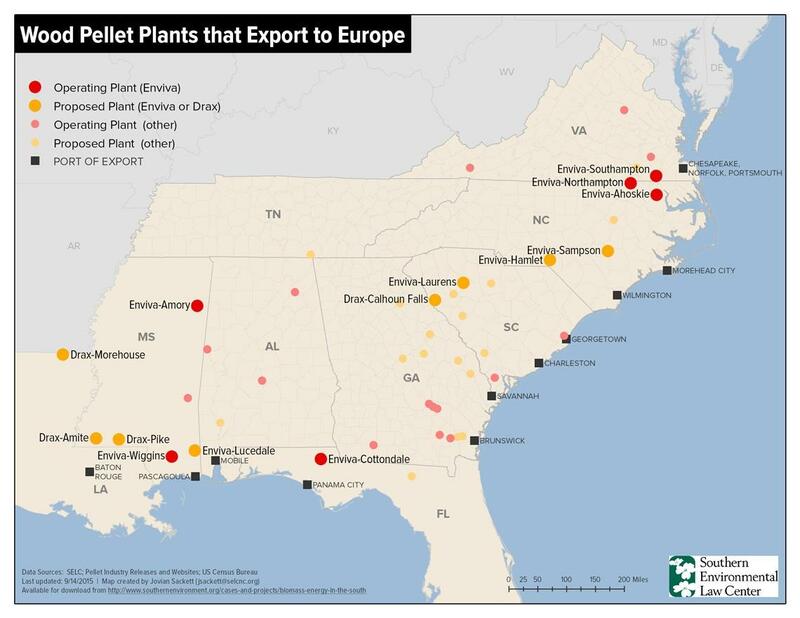 How this plant came to be – in a remote corner of northeastern North Carolina – is tied directly to a decision made six years ago, when the European Union inadvertently created the market for wood pellets. “It’s all an export market driven by European demand, driven by big government subsidies in Europe, and driven by a false belief that this is benefiting the climate and is carbon neutral,” says Derb Carter with the Southern Environmental Law Center. In 2009, The EU released its 20-20-20 policy for reducing greenhouse gas emissions. It set as goals a 20% reduction in carbon emissions, 20% use of renewables for electricity production, and a 20% increase in efficiency. That sparked enormous growth across Europe in solar and wind. It also led several utility companies – including Drax in the UK – to convert some of its coal-fired plants to biomass, or wood pellets, to meet the renewable standard. And that’s true, in theory. What’s not so fine is using whole hardwood trees to make pellets. Soft woods – like pines in plantation forests – take 20-to-30 years to regrow. Hardwoods take as long as 100 years – lengthening the so-called carbon debt. Whole trees are clearly being used at the Enviva wood pellet plant in Ahoskie. According to documents Enviva provided to Drax, about 80% of the wood used to make pellets at that plant come from hardwoods. At other plants in North Carolina and Virginia, that percentage is even higher. “The vast majority of this is low-grade or leftover wood that is very, very appropriate for wood pellets,” said Kent Jenkins, a spokesperson for Enviva. Operating and proposed wood pellet facilities across the southeast. DRIVING THE TWO-LANE HIGHWAY between Ahoskie and Oak City, it’s impossible to miss forests getting clearcut and huge log trucks rumbling down the road. The trees that are cut here will be used to make everything from lumber to toilet paper. And, because of the close proximity of the Enviva plant a few miles away, it’s very likely some will become wood pellets. Those wood pellets are shipped from the southeast U.S. to Europe, creating even more carbon on the way. But why? Why are European companies turning to suppliers here for trees? Turns out, the southeast is one of the few places on earth where, when the land is left alone, trees will dominate. North Carolina has a long history of forestry. Nearly the entire state was clearcut by the beginning of the 20th century to make way for farms. But because of favorable growing conditions, about 60% of the state is now covered with trees. The vast majority of that forest land – almost 90% – is privately owned. And because this is the South, it’s also largely unregulated – with landowners allowed to do pretty much whatever they want with their land. “And that’s the way the founders of the United States kind of set it up,” says Pryor Gibson with the North Carolina Forestry Association. Gibson says many individual forest landowners, like himself, use the land as a secondary source of income. It provides revenue at various times, when the forest is thinned and again when it is clearcut. While no law exists to make him re-plant the trees that serve such a vital role in absorbing carbon, he says it’s in a landowner’s best interest to do so. “No thoughtful landowner, nobody that got up enough money to buy the land and plant the land, is going to be stupid with the land,” says Gibson. But the landowner could sell the land. The Forestry Association is in a constant battle to, as Gibson says, keep the land “in trees” – and not have landowners choose to convert forest-land to farmland or development. This is one area where landowners, foresters, and ecologists agree – the more land devoted to trees, the better. To be most effective, the forested land must also be ecologically diverse – and not a forest plantation that won’t support a diverse ecosystem – as well as help to pay the carbon debt. The exploding market for wood pellets is still not a primary factor in the economics of the forestry industry in North Carolina. Home starts and even the growth of the adult diaper industry are stronger factors in driving wood prices. But that may change in the future. As many as two-dozen wood pellet plants are planned across the south, as are port facilities in Wilmington and other locations. That will likely drive up the market for hardwoods to make pellets. Forestry is expected to be a topic during the upcoming Paris Climate Talks – albeit not one that will grab headlines, like the issues surrounding coal. Whatever policies are developed there will be geared toward reducing global warming. But those choices will also significantly alter the landscape – physically and economically – of the southeastern United States for decades to come.